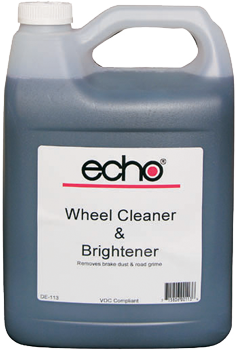 Echo® Wire Wheel Cleaner & Brightener is a special blended acid wheel cleaner. It is designed to remove brake dust and road grime with little or no effort. Spray on and hose off, in most cases. 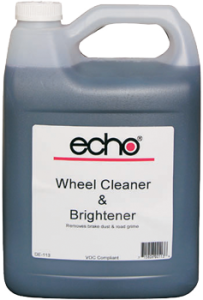 The metal brightener in Echo® Wire Wheel effectively enhances the shine on most wheels. It is ideal for automatic car washes. The non-flammable, water soluble properties make it an outstanding cleaner for those difficult to clean jobs in plants or shops. It complies with CARB / OTC VOC restrictions. This product is not recommended for uncoated or aluminum wheels. 2. Let sit for 1-2 minutes and rinse off. Some brushing may be necessary. 3. May be applied via automatic dispensing systems or through trigger or tank sprayers. 4. Mix 6oz. into a premixed car wash solution for fall out remover. 5. CAUTION: Apply to COOL wheels. AVOID APPLICATION TO NON-FACTORY WHEELS.